The yellow-brown rock on the banks of Wadi Al Khawd was originally the sea floor. Between 55 to 34 million years ago (Eocene) the sea was rich in marine life and the remains of marine creatures like sea slugs, clams and coral settled in sedimentary layers. Within these layers the bones of the harder shelled animals formed jumbled groups with empty spaces as seen in the fossils. 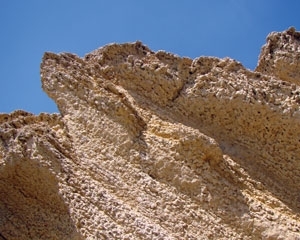 Over time, the limestone has been lifted above sea level and exposed the nodular texture of these lumpy masses of hard shells. Take a walk or 4WD drive into Wadi Al Khawd and take a trip back in time.